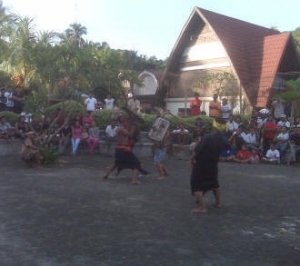 Presean is an extreme fight game as the symbol of masculinity of Sasaknes man in Lombok. This game is battle of two men armed with rattan sticks in Sasak language called Penjalin and armored buffalo skin thick and hard called Ende. Two men fighters armed with "Penjalin" attack to each other, defending their opponent's blows with Ende. The fighters in local Lombok language "Sasak" called Pepadu, they are come from selected brave and gentle man who just wearing 'Sarung" and headband without any clothes or other body and face protectors. 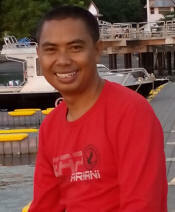 There is "Pakembar" as the referee of the game. 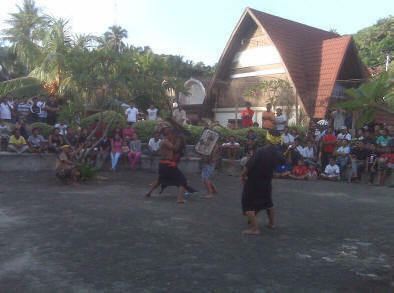 The game performance with Lombok traditional music called "Beleganjur" and a commentator giving spirit to the fighters. Uniquely from Presean fight, the participants or Pepadu had never been specially prepared. Duel two pepadu held in five rounds, the winner is determined by the results obtained value or one of pepadu leaky head, referee will stop the game if the fighter get blood even they still strong enough to fight. 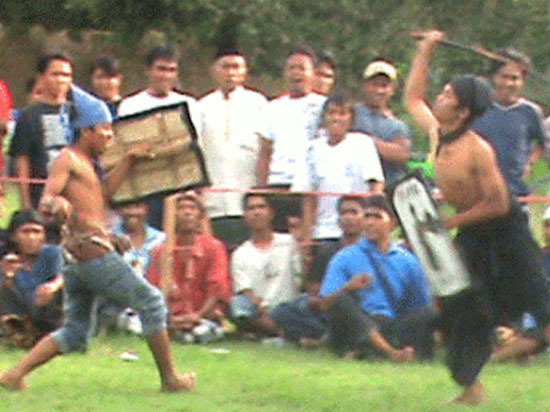 Pakembar (referee) even request visitors or audience to participate toying with rattan sticks and shields provided. The audience / prospective participants can propose themselves or be selected by the referee edge and fight with other visitor or those selected fighters. All consequences caused in the game is on own risk of fighter even though there is very simple emergency medical treatment. The winner awarded with packed of cigarette, body soap and shampoo or an envelope with small amount of money. There is no big reward actually for the winner but young man who like this game to express their spirit also as a manifest of love to Lombok culture. The match end with greetings and hugs of friendship between the fighters. No sign of resentment and all just a game! It's really casual. The scenery of Presean culture a lot perform for celebration of Indonesia Independent day in Lombok, a week before and after independent day of Indonesia (August 17) and also on other cultural event such as Bulan Apresiasi Budaya (BAB) as government program to Introduce of Lombok culture in general tourist society and one week perform on Senggigi Festival in July.